Looking for a fun rainy day craft project for the kids? 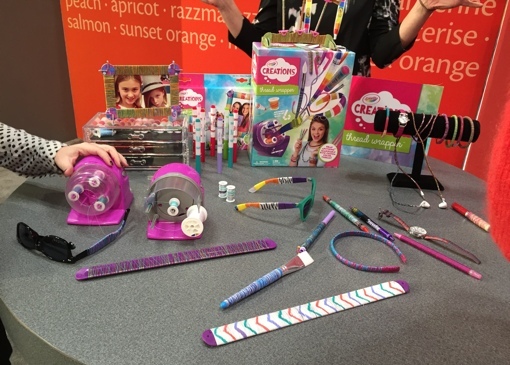 This week at the 2015 American International Toy Fair in New York City, Crayola introduced its latest product, the Crayola Thread Wrapper. It’s a small, motorized device that wraps everyday objects with thread, turning the bland into colorful, eye-catching works of crafty art. As you can see, the folks at Crayola were more than happy to give Techlicious a demonstration of its new product. It quickly added dashes of bright color to everyday objects like hairbands, bracelets, sunglasses, pens, slap bracelets, picture frames and more. The possibilities are limitless – or, at least, limited only to your creativity and the spools of thread the kids fish out of your family sewing machine. Each Crayola Thread Wrapper comes with the motorized unit, a re-threading attachment, 6 colored thread spools, 2 empty spools and a fine line fabric marker so kids can create their own colored threads. When that initial supply runs out, you can upcycle old thread from around the house or just buy a new spool at your favorite fabric store. The Crayola Thread Wrapper is designed for kids aged 8 through 12. It’s expected to hit store shelves this July, and will retail for $24.99. In the meantime, check out Crayola's big product announced at last year's Toy Fair, the Crayola Virtual Design Pro augmented reality coloring kit, available now.